I thought that was a good comment, so I put it on Twitter. After dinner I was helping him with his math homework, and I peeked at my Twitter mentions. His comment had been retweeted twice, and someone responded by saying, “That would require ‘The Donald’ to have a soul.” My son thought that being retweeted was kind of cool. Over 450 people had repeated it. Needless to say, he was really excited, even though he didn’t fully understand the dynamics of social media (or really, why his well-meaning comment about philanthropy had struck like a well-timed bolt of lightning). As a former English instructor, I’d like to think this is empowering for him: that a good message will cut through all the noise, that it’s worth speaking up … that he might even affect change. Will that happen? Hard to say. 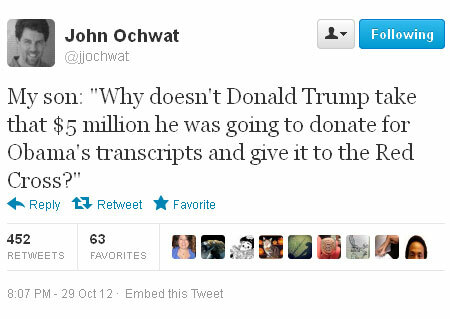 I think the tweet struck a chord because people were fed up with Trump’s grandstanding that if President Obama released his college transcripts, Trump would donate $5 million to the charity of Obama’s choice. It’s a gambit that looks particularly awkward, now that New York and surround states are facing billions in damages. 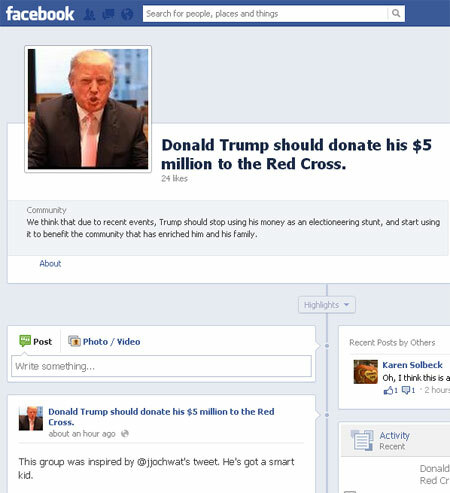 Then again, about 10 percent of the mentions thought Obama should comply; apparently they were more concerned with how Obama did in college than they are about Hurricane Sandy wreaking havoc on the eastern U.S.
Can you see that first post? That’s the part that made me happy.